I never met William Warren, though I wish I had. The legendary American expat and writer was a resident of Bangkok from 1960 until his death in mid-November, 2017. I lived in Bangkok from late 1999 until late 2001, and have visited another 30 or so times since. From what I hear, Mr. Warren was still hale and hearty throughout most of the time I've been in and out of Thailand's capital. Alas, connections are everything, in Bangkok more than most places, and there was no one to connect me to him. Fortunately, I was able to get to know something about him through his books. He wrote a lot of them. According to a 2014 profile in the Bangkok Post Magazine (https://www.bangkokpost.com/opinion/opinion/1363563/the-bangkok-type), he has some 50 titles to his name. I estimate that I've read only about a fifth of them, but I'd imagine that just about every literate, English-speaking expatriate resident of or visitor to Thailand has read at least one. Mr. Warren will probably be remembered most for his books about the life and legacy of Jim Thompson. The latter, an American born in 1906, was a generation older than Mr. Warren. He arrived in Thailand in 1945 with the O.A.S., the precursor of the C.I.A., and stayed on for the rest of his (known) life. Along with H.M. Queen Sirikit, Jim Thompson was instrumental in reviving the then dying art of Thai silk weaving. He founded the Jim Thompson Thai Silk Company, which is still going strong. His career came to a startling, sudden end when he disappeared from his hotel in 1967 while holidaying in Malaysia's Cameron Highlands. 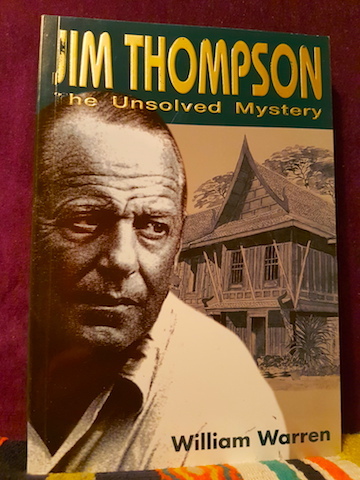 Mr. Warren, who knew Jim Thompson personally, wrote Jim Thompson: The Unsolved Mystery in 1970, and then updated it in 1998. My paperback copy of the latter edition is pictured below. The house pictured on the cover is Thompson's own. The Jim Thompson Foundation still keeps it as it was at the time of his disappearance, and it is open to the public. 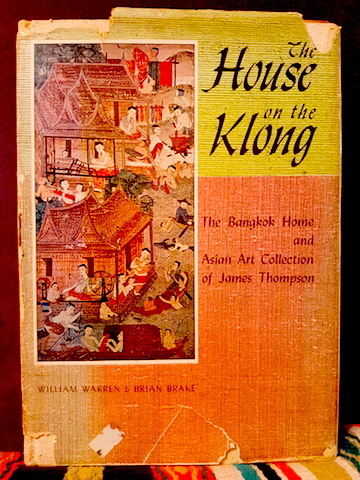 Mr. Warren wrote a book about it, too, The House on the Klong: The Bangkok Home and Asian Art Collection of James Thompson. The book, which first came out in 1968, had been planned by Jim Thompson before his disappearance. Mr. Warren notes on the first page that "the book is very much as James Thompson planned it." I own a vintage edition printed in Japan in 1970 (see the cover below). 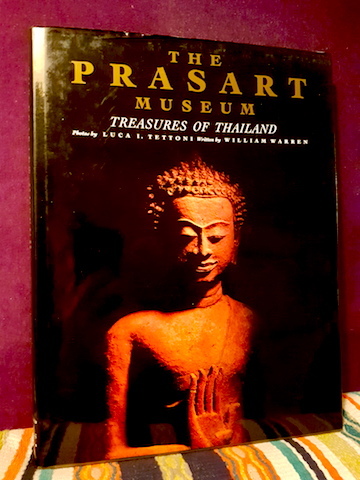 Something of an expert on Thai art and culture, Mr. Warren was often commissioned to write the texts for coffeetable-type books about these topics. 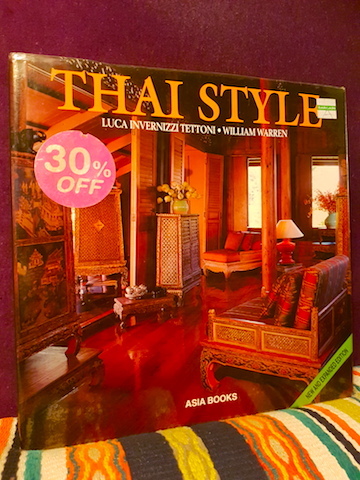 One such that I have on my shelves is Thai Style, which is lavishly illustrated with photographs by Luca Invernizzi Tettoni. I purchased the copy pictured below when I was living in Bangkok, and it's followed me around ever since. Given that Mr. Warren was for 30 years a full-time English instructor at Chulalongkorn University, Thailand's most prestigious university, I surmise that he was never quite able to make a living from his books. This is a fate that has befallen more than one expat author who writes about his/her adopted country. Donald Richie, the late American observer par excellence of Japan, once lamented that despite having written and published more than 40 books, he'd always had to have a day job. 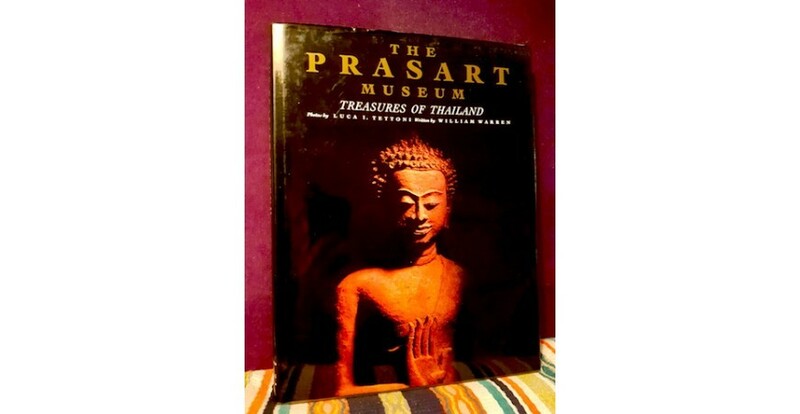 Consequently, Mr. Warren must have been glad to accept the private commissions that came his way, including the one pictured below, a beautiful volume about the privately-owned Prasart Museum, one of Bangkok's truly hidden gems. My copy of it was signed by Khun Prasart when I visited the museum in 2002. I wish I could have had Mr. Warren sign it instead. Long before his death, the Jim Thompson Foundation honoured Mr. Warren by naming its library after him. You can visit the library's website here: http://www.jimthompsonartcenter.org/william-warren-library. William Warren was a great friend to Thailand. His books have informed generations of English-speakers interested in learning about the Land of Smiles, and many of them will remain standard works for generations to come. RIP, Mr. Warren.